With hook in vise cover hook with a base layer of thread from eye to start of bend or a little beyond. Cut 2 lengths of wire (the length of your desired nymph body). Cut tapers at both ends of wires. 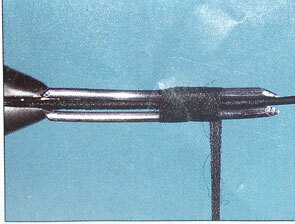 Make uniform tapers with points on same side of wire (to lay against hook shank). With thread hanging 1/3 back from eye, place 1 wire along each side of the hook shank and tie on at the same time (tapered points along shank). 5. Wrap the middle 2/3 first, then cover all the tapered ends (try to keep the wires on the sides) whip finish. 6. Using a needle nose pliers or flat tweezers (smooth flat jaws, serrations will cut the thread) squeeze from top to bottom to uniformly shape /flatten the wires to form the wide body. 7. Lightly coat the top with a fast drying head cement or zap-a-gap and let dry while you prepare your materials to add. 8. Tie your normal Stone or Hare’s Ear nymph..
Thread: you can use normal tying thread but Uni-Stretch thread has some advantages: It covers quicker, easier to uniformly cover tapers, and because of the stretch you can uniformly shape the wires easier if the wire moves to the top or bottom while your covering with thread.2. Wire: use size .020 or .030 copper, lead or any other stiff material. Lightly coat top of base using a bodkin or paper clip.